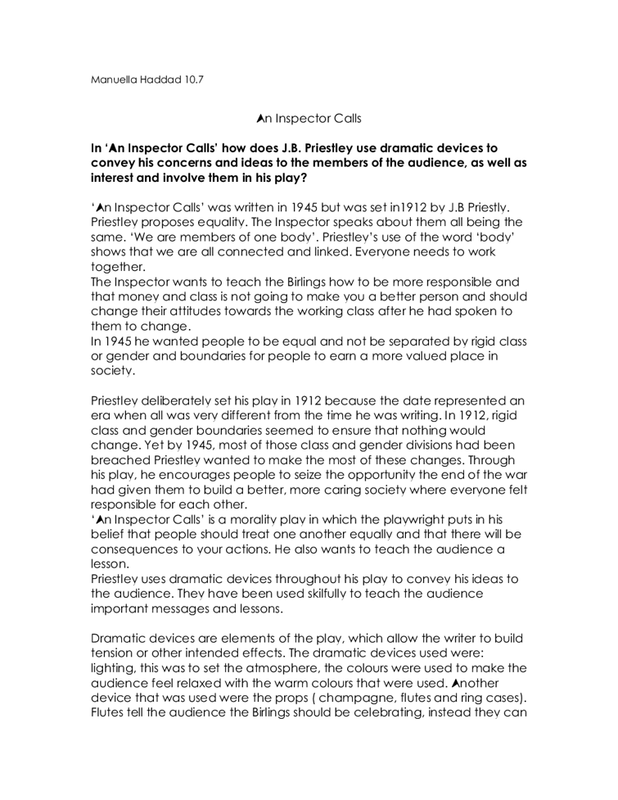 In ‘An Inspector Calls’ how does J.B. Priestley use dramatic devices to convey his concerns and ideas to the members of the audience, as well as interest and involve them in his play? 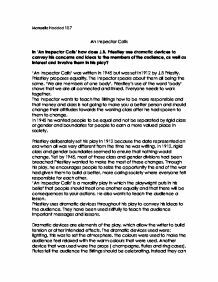 ‘An Inspector Calls’ was written in 1945 but was set in1912 by J.B Priestly. Priestley proposes equality. The Inspector speaks about them all being the same. ‘We are members of one body’. Priestley’s use of the word ‘body’ shows that we are all connected and linked. Everyone needs to work together. The Inspector wants to teach the Birlings how to be more responsible and that money and class is not going to make you a better person and should change their attitudes towards the working class after he had spoken to them to change. In 1945 he wanted people to be equal and not be separated by rigid class or gender and boundaries for people to earn a more valued place in society. Priestley deliberately set his play in 1912 because the date represented an era when all was very different from the time he was writing. In 1912, rigid class and gender boundaries seemed to ensure that nothing would change. Yet by 1945, most of those class and gender divisions had been breached Priestley wanted to make the most of these changes. Through his play, he encourages people to seize the opportunity the end of the war had given them to build a better, more caring society where everyone felt responsible for each other. ‘An Inspector Calls’ is a morality play in which the playwright puts in his belief that people should treat one another equally and that there will be consequences to your actions. He also wants to teach the audience a lesson. Priestley uses dramatic devices throughout his play to convey his ideas to the audience. They have been used skilfully to teach the audience important messages and lessons. Dramatic devices are elements of the play, which allow the writer to build tension or other intended effects. The dramatic devices used were: lighting, this was to set the atmosphere, the colours were used to make the audience feel relaxed with the warm colours that were used. Another device that was used were the props ( champagne, flutes and ring cases). Flutes tell the audience the Birlings should be celebrating, instead they can sense tension and some unease. The ring gets the audience excited about a possible proposal. Dialogue was another dramatic device used, Birling makes many ill - judged predictions about the future. The audience know that what he says does not happen. This will make the audience lose faith in his character. He will be seen as wrong and old fashioned. Costumes was also one of the devices throughout the play. Men are wearing tails and white ties. This tells the audience that the Birlings are wealthy. They’re celebrating. J.B. Priestley is lulling the audience into a false sense of security. The dramatic irony used very early on in the play is effective. Birling could make incorrect predictions about the titanic being ‘absolutely unsinkable’ and WW1 (which started two years later) . Mr Birling is made to look very stupid by J.B. Priestley. He does this because Mr Birling is a capitalist which Priestley disliked. Priestley uses lighting in his play to the changes in the atmosphere as at the start of the play the lighting is calm and casual, however when the Inspector enters the room it all ‘brightens’ up as if an angel has come on stage. The audience are forced to focus on this visitor and are curious to find out what he has ‘called’ for. The effect of having introduced a new major character has made all the other family members realise that they all know Eva Smith but just pretended they didn’t or even haven’t heard of her. It is very clever how Priestley has written it so that they are all ‘responsible’ and had a part to play. The characters exit furthers the plot more by the way they leave. This is when there is a main character in the play on stage, the audience are focused on them and when that character leaves the audience will instantly focus on the other characters on stage until the main character re-enters. The end of act 1 had an effect on the audience. Tension is skilfully created here. The act ended on a cliff hanger so it makes them want to see the next act having been stimulated and challenged this far. Inspector Ghoole himself is a dramatic device as his name ‘Ghoole’ meaning ghost. which really gets you thinking if he really is an Inspector especially when Mr Birling phones up and asks about the inspector and they find out that there isn’t anyone with that name. In conclusion J.B. Priestley uses dramatic devices to transfer his concerns and ideas to the members of the audience as well as to get them interested in the play. During act 1, the playwright changed my opinion of the Birlings because they are wealthy people and they think having money and being in the upper class will make them a better person than the less fortunate ones. The methods that Priestley uses to interest and involve the audience is by using various dramatic techniques such as dramatic irony, cliff hangers, lighting and setting. He uses all his techniques to show his message and make sure the audience understand it. They also create tension. The playwright’s message is very true and everyone should be treated equally and it is relevant today because everyone should be responsible for one another. This student written piece of work is one of many that can be found in our GCSE J.B. Priestley section. How does Priestley create drama and convey his concerns in 'An Inspector Calls'? How does Priestley create tension in the play through characterisation, structure and atmosphere? women stays at home looking after children and Preistleys aim is to prove all what Birling values wrong. The assortment of goods laid out on the table as well e.g. decanter of port; cigar box and cigarettes show their upper class ness. The play is set in 1912; however it was first preformed in 1945. Priestly set the play in 1912 to show how arrogant and confident Mr Birling is. In 1945 the Titanic had already sunk, but as the play was set in 1912, in the play it hadn't yet. In 1945 after World War Two people longed for a social change; for example Labour's Clement Attlee won a landslide victory over the Conservative Winston Churchill. Priestley conveys his main concern here that everybody should have equal rights. "An Inspector Calls" is a mysterious drama: it is to be performed on stage not read. He says that strikes between workers and their bosses will come to nothing. But he's wrong; in 1912 there was the Lawrence textile strike, the audience of 1946 having the hindsight of knowing this. He then goes on to say that the technologically advanced Titanic ship is 'unsinkable, absolutely unsinkable'. This cause's bad tension between the two of them as Gerald is obviously guilty of the fact as he does not want to share this and Sheila is angry and distressed at Gerald. Gerald begs Sheila not to say anything to the Inspector as he says that neither of them is responsible for the suicide of the girl. The Birling family home is really summed up when it is described in the Stage Directions as "substantial", "heavily comfortable" and "not cosy and homelike". Everything is not as it seems and things seem a bit too home-like and fake. Priestley is showing how in the rigid class system of 1912, the upper class didn?t have any respect for the lower class, portraying the selfishness of the upper class as they don?t appear to want to know the affairs of the lower classes.